Nikola Tesla museum: Elon Musk pledges $1 million to The Oatmeal's Matthew Inman. There’s crowdfunding, and then there’s Muskfunding. On Thursday, a celebration of Nikola Tesla’s birthday was enlivened by an announcement: Elon Musk, CEO of the electric-car company that bears Tesla’s name, will donate $1 milion to help build a museum honoring the late inventor. The gift came after Matthew Inman, creator of the webcomic The Oatmeal, implored Musk to contribute to the grassroots effort to build a Nikola Tesla museum on the site of his former laboratory on Long Island. An Indiegogo crowdfunding campaign called “Let’s Build a Goddamn Tesla Museum” had already raised some $1.3 million to preserve the property, but Inman and his collaborators soon realized it wasn’t nearly enough to build a whole museum. Musk promptly responded to Inman on Twitter, saying, “I would be happy to help.” He didn’t say at the time how much he would contribute, though. Inman had estimated the museum would cost $8 million. Musk apparently wasn’t willing to bankroll the whole thing on his own, but his gift should certainly kickstart the fundraising effort. He also pledged to build a Tesla Supercharger station on the site. Elon Musk: from the deepest wells of my geeky little heart: thank you. This is amazing news. 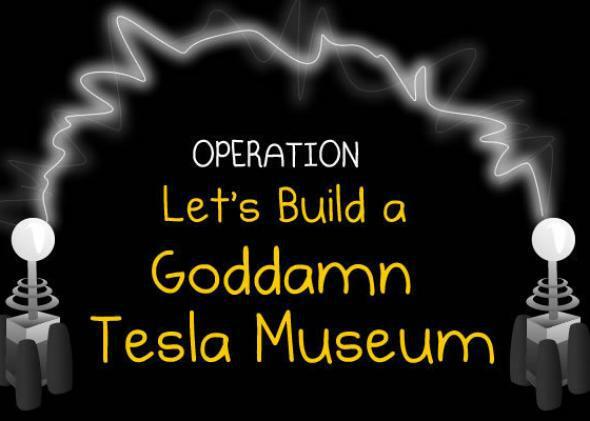 The Oatmeal Cartoonist Begs Elon Musk to Help Fund a Museum. Musk Agrees.